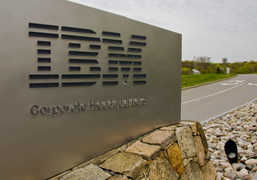 With its sights set on a Department of Defense deal, technology giant IBM announced Tuesday it was teaming up with EHR behemoth Epic Systems to compete for the DoD Healthcare Management Systems Modernization contract. The DHMSM is slated to replace the current Military Health System and will serve some 9.7 million beneficiaries. The partnership will leverage Epic's interoperable platform, which is among the highest-ranked and most widely-adopted EHR systems in the nation. Its open architecture supports more than 20 billion data transactions to other systems each year, according to company officials. Epic's platform is currently utilized by big name hospitals including Cleveland Clinic, PartnersHealthCare and Kaiser Permanente. "Service members, their families and the healthcare providers who care for them deserve the best healthcare our country can provide," said Carl Dvorak, president of Epic in a June 10 statement. "They would benefit from an integrated system that leverages best practices from other large and successful healthcare organizations. We would be honored to be part of the solution to modernize the MHS. In collaboration with IBM, we can provide a successful implementation that will support innovation and interoperability within military healthcare." IBM will contribute its system integration, change management and operational expertise in delivering large-scale transformational solutions alongside complementary software and services providers. According to the company, the Epic customer community -- currently including 100 million patients -- exchanges more than 2.2 million records each month with other EHRs vendor platforms, HISPs, HIEs, and Department of Veterans Affairs, DoD and the Social Security Administration. Leading the team will be IBM's Federal Healthcare practice and backed by the IBM global information technology, research and healthcare organizations, which collaborate with Epic in support of EHR solutions globally. Some 300 federal healthcare consultants in addition to dozens of physicians and healthcare professionals will comprise the team. "Our collaboration with Epic for DHMSM was a natural extension of our global partnership," said Andy Maner, Managing Partner, IBM US Federal, in a statement. "Together we understand that we must step forward and bring our best to improve health outcomes for those who proudly serve our nation. Improving quality of care and reductions to the overall costs for our military will be our primary goal. This is going to require bringing a physician's mindset, proven past performance and a commitment to innovation." Keith Salzman, MD, chief medical information officer at IBM, will lead the partnership between the two companies. Salzman has been involved in medical informatics and healthcare for 20 years, officials note, driving the use of medical informatics within the MHS and exchanging data and documents through interoperability between the DoD and VA systems. "With DHMSM, we have the opportunity to begin a historic transformational journey for the DoD, and pave the way for the modernization of the entire ecosystem of healthcare delivery for our nation," said Salzman, in a statement.